Update: The video has been flagged as SPAM on Vimeo. Added Download link. YouTube banned my video compilation of Bane's quotes for the Batman sequel The Dark Knight Rises. When it was uploaded to YouTube, I immediately got a notice it was blocked worldwide. A warning also popped up that our account would be banned if we tried it again. Why? Because it included clips from The Dark Knight Rises 6 minute IMAX prologue. At first I said, "skip it." But then I remembered I worked pretty hard on it and people may want to watch it. So I uploaded it to Vimeo. Here it is. Let me know what you think. Before it gets taken down again. Vimeo flagged it, so here are the download files. In the end, I decided to just remove the IMAX clips and upload the video. 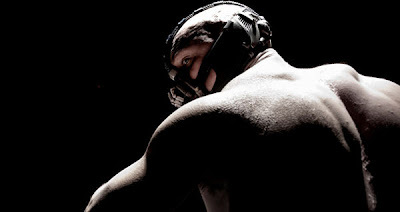 There are two versions: The top one is All Bane's Quotes From The Dark Knight Rises which has stills and quotes from actor Tom Hardy and director Christopher Nolan. The second one is All Bane's Quotes From The Dark Knight Rises - Short which just has the clips and nothing else. What do you think of the videos? What about Bane's voice? Is it hard to understand? Do you think he'll be a good villain? Where Can You See 'The Dark Knight Rises' In Real IMAX? Good job on the video! Hope it stays up a while. Bane is a little hard to understand but think he'll still be a good villain. Thanks Alex! It's my first video compilation so I'm hoping it turns out well. Bane is a fascinating character. I'll have to remember to watch that later. His voice is hard to understand on my tiny computer speakers but I imagine it'll be easier in giant movie theater speakers, especially IMAX ones. Bane will make a good villain. Kudos to you for angering the YouTube gods. LOL Thanks Michael. Good thing we have options on the Internet. Bane will be good, but not Joker good IMO. Pat, out could be the speakers our it could be his voice. ;-) The sound in IMAX should be amazing. I see that Alex. It didn't catch my reply either. I'll look into it. I'm going to have to listen to this later. I tried, but couldn't really here over the mowers on the golf course. I'm relaxing on my parents back patio on vacation, so I'm just not motivated to move right now. :) I will watch later. Hopefully before it is removed. ;) I'm sure it is awesome! Sorry about all the hassle trying to get it posted! he looks like a good villain to me--suitably scary and not too campy... I mean sure... comic campy, but not ridiculous campy. The voice seemed a little higher than I'd like in some of those and in others it seemed okay... guess I'd need to see more for an overall effect. Thanks Ciara. The videos were taken down by Youtube and Vimeo, so I just recut the trailer to remove the prologue and put it on Youtube. Enjoy your vacation! Hart, I know what you mean. When I first heard the Joker's voice it took a little getting used to.Hopefully in the film his inflections make more sense. The prologue clips really showcase his voice. Sorry I can't share them. I really cannot wait for this. Bane is going to be a superior villain, right on par with Ledger's Joker. Nolan really knows how to create some amazing villains then get the perfect actors to bring them to life.